​In 2015, California encountered a serious problem with a continuous four-year drought. According to the California Department of Water Resources, the level of snowpacks are lower than any year since 1950. Sonoma has several significant reservoirs:, Roberts Lake, Santa Rosa Creek Reservoir and Lake Suttonfield, which store water for human use. Meanwhile, a lot of rivers and lakes are dwindling. The most significant is Dry Creek, a 43-mile-long tributary of the Russian River. 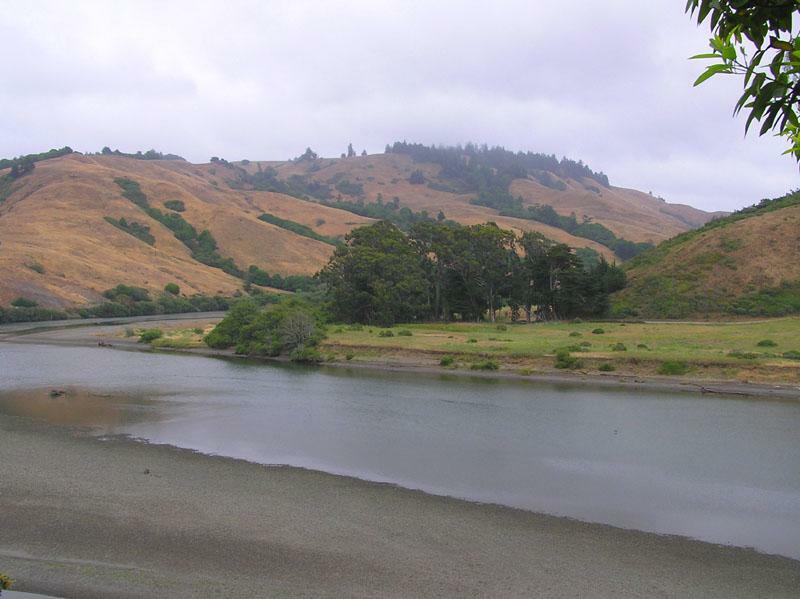 Lake Sonoma is an important lake due to the fact that it supplies most of the water resource for the county and its development. Although the government has been taking action to try to solve the problem, Sonoma Lake’s water level continues to drop. If the river basins run out of the water, most of the human activities will not be able to take place and many species will suffer extinction. A sustained effort of emergency funding may solve the problem in the short term. But then, the population of some species living around the area will encounter an extinction crisis. For instance, the extinctions of numerous native fish species, including most salmon will take place. Although climate change can be named as a cause, mismanagement of the water supply has accelerated the issue. The mismanagement of water supply occurring in Sonoma is due to the fact that the water availability has been overestimated, the river’s annual flow and desperately needs a revision to monitoring. A wicked problem can be defined as a problem that involves a high level of scientific and social/value uncertainty. The degree of scientific certainty is based on how complex and complete the knowledge is on the issue, whereas the degree of social uncertainty is influenced by the number of varying values, goals, interests, and acceptability of risk among stakeholders (Balint et al., 2011). Not only can defining an environment and resource management problem become a problem in itself, but evaluating and developing potential solutions typically involves contested criteria, and resistance in the face of multiple values, goals and interests (Balint et al., 2011). When the knowledge and confidence in the information on the issue, probability of outcomes, and number of alternatives are low, degree of conflict and number of stakeholders high, you are facing a wicked and ill-structured problem. In the presence of a record-breaking period of drought, California’s Sonoma County offers insight into the complexities of managing water. Both limited availability and (mis)management of water have spurred sour sentiments, and ultimately competition between varying regional stakeholders, who value water for different purposes. While the freshwater aquatic ecosystem relies on abundant water flows for the survival of its key species, vineyard owners and agricultural developers are concerned with supplying water to support economic output (Parrish, 2015). Local water also supplies the residential community for subsistence and recreational use. Remaining stakeholders include, law-enforcement/regulating authorities, and environmental agencies and advocates. These varying stakeholder interests introduce value uncertainties. For instance, the local residential community remains resentful towards the County’s preferential treatment of wine-growers (i.e. lack of monitoring of water use by vineyards), arguing that both money and “political muscle” have safeguarded the industry against legal authorizations. In contrast, many vineyard owners are opposed to regulation, often questioning the ‘legality’ and scientific claims about the environmental impacts of water withdrawal. Contested scientific knowledge on water supply and management practices further compound the varying list of stakeholder interests. Scientific uncertainty has been introduced due to: the discrepancies in water permit regulations, inherent challenges of measuring cumulative impacts of regional water withdrawal, and challenges in predicting freshwater ecosystem behavior. The incompatibilities of stakeholder interests, coupled with inconsistencies in knowledge and confidence about the future of water in Sonoma, make this issue particularly wicked. The location of human development and resource extraction prove incompatible with natural flow patterns and water supplies in the different catchments of the Russian River. Agricultural development, wineries in particular, mining practices, and the use of hydroelectric dams, have posed threats to the supply and quality of freshwater in Sonoma County. Large-scale and centralized diversions made by dams disturb the natural flow regime of the river, while also disrupting migratory routes of fish species (Gordon and Meentemeyer, 2006). Furthermore, agricultural construction and development have compromised riparian vegetation along river banks; increased sedimentation loads, river-bank erosion, and run-off; while in some cases, also reducing the shade/coverage needed to protect waters (Schlosser, 1991). In Sonoma County, where “virtually all agricultural water needs are met individually and locally,” water withdrawals tend to parallel individual needs, which typically occur when streamflow is already low/more vulnerable (i.e. in the dry season/summer months) (Deitch et al., 2009, p. 119). In order to safeguard grapes in the warm months, grape growers have been known to divert large sums of water for heat protective practices. The cumulative impact of this individual pattern of withdrawal (especially when dispersed over time and across different points along the river system) not only disrupts streamflow, but also poses particular challenges for measurement, and thus proper regulation and enforcement (Deitch et al., 2009). Wineries are also implementing unregulated pumps that do not align with the jurisdictional requirements of the California State Water Code. As outlined by Bland (2011), preferential treatment of the wine industry by Sonoma County has promoted the mismanagement of regional water supplies by enabling unregulated water withdrawal from local streams and rivers. Furthermore, the lack of regulation also exists at the pre-winery development phase, which often involves the omission of environmental impact assessments, thus allowing certain vineyard owners to expedite environmentally questionable development plans (Bland, 2011). When contextualized under current regional drought conditions and other threats, the weak regulation framework and informal political muscle of local wineries, contributes to both scientific and social uncertainties. The supply of water in the region is heavily stressed by agricultural practices/development and overuse (ex. drawing water from local streams to fund irrigation measures and off-site water storage), but also exacerbated by climate change. Warming temperatures and changes in precipitation have had adverse effects on the supply of water in freshwater ecosystems, especially when coupled with watershed disturbance, pollution, resource development and/or biotic changes. Warming temperatures and increased evaporation rates have the capacity to make freshwater habitats unsuitable for fish species by decreasing water levels and increasing water temperatures to a point that cannot sustain biotic life in the water (Schlosser, 1991). 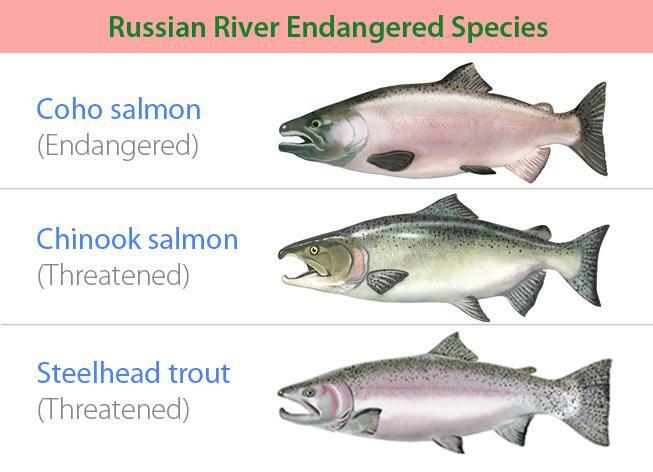 At the centre of the struggle against dwindling water supplies, lie three ecologically crucial, but endangered/threatened (as listed under the federally administered Endangered Species Act), salmonid species; Coho, Chinook, and Steelhead (see Figure 3). These species are made increasingly vulnerable to the mounting biological, chemical, and anthropogenic stressors as mentioned above (regional agricultural development, local dams, and climate change). While these species may serve humans directly through the provisioning of food, and cultural benefit, they are also vital for the regulation of freshwater ecosystems. 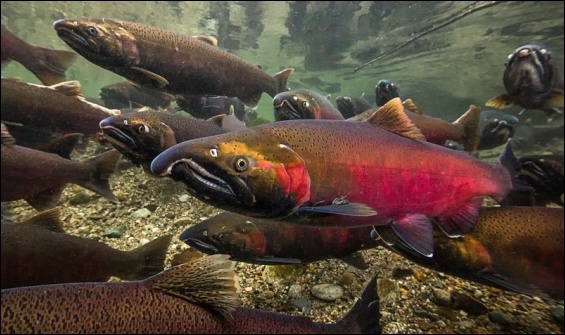 Each year, after spawning, salmon die and cycle their nutrients back into the ecosystem (see Figure 2). Dangerously low water levels in many of the Russian River’s tributaries and local creeks, coupled with the run-off of sedimentation from agricultural development and increasing erosion of the river’s watershed, have threatened appropriate conditions for the spawning and migration of Coho salmon and Steelhead trout. A leading developer in the region has been the wine industry, raising questions and debates about anthropogenic stressors and threats to the ecosystem and regional water supply. The rich watershed of the Russian River has attracted wine agriculture development since the late 1990’s (Moran, 2012). The County of Sonoma Department of Agriculture stated that vineyard acreage increased “from 40,001 acres in 1997 to 64,073.2 in 2013…with most expansion occurring in the Russian River watershed” (Parrish, 2015). The business not only demands large quantities of water, but frequent development and construction has also strained the quality of water. ‘Governance’ represents the ways in which rules, norms, and actions are produced, reproduced and regulated throughout a system (Darby, 2010). Consequently, governance should not be confined to a mere understanding of decision-making processes, but extended into the realm of normative and customary practice as well. The global scale sets the precedent/the ideal for how we should conceptualize water as a resource and informs how we might conserve it for the future. The UN has recognized that without access to clean water and sanitation, all other humans rights cannot be realized (UN Human Right to Water and Sanitation, 2010). If we are to analyze water supply and management trends in Sonoma County, California, we must assess the normative standards that are constitutive of regional and state-regulatory bodies. 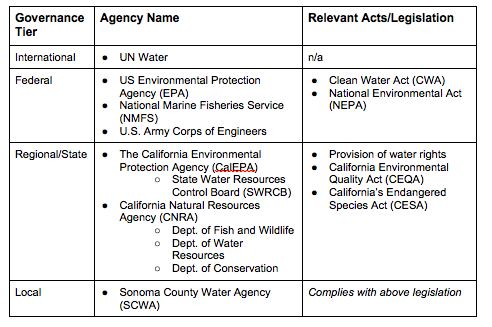 What follows is a brief overview of the main regulatory agencies and relevant legislation/policies that oversee both water-management and supply in Sonoma. At the federal level, U.S. water concerns are overseen by federal agencies like the EPA, NMFS, and the US Army Corps of Engineers. The primary federal law governing water pollution is the Clean Water Act (CWA). The act establishes the basic structure for regulating “quality standards for surface waters,” while the EPA enforces requirements under the act by working with federal and state regulatory partners to monitor compliance (U.S. Environmental Protection Agency, 2015). The governance framework for water management is divided between federal and state levels to an extent, but in general State agencies hold most of the authority. Water management in California represents a complex bureaucratic web of laws, policies, and institutions, which struggle to properly allocate surface water, groundwater and riparian water rights. The California state government is organized into large cabinet-level agencies. Those pertaining to water supply management, include: CalEPA and CNRA. Various boards and departments also exist within both parent agencies, to account for the oversight of different resources and/or a niche area (see chart above for relevant department structure). The most relevant department within CalEPA is the State Water Resources Control Board (SWRCB), which alongside regional sub-boards has joint authority over the allocation of water, the protection of water quality, and the administration of water rights (California Environmental Protection Agency, 2015). For over 100 years, surface water has been governed by the SWRCB (Littleworth and Garner, 2007). 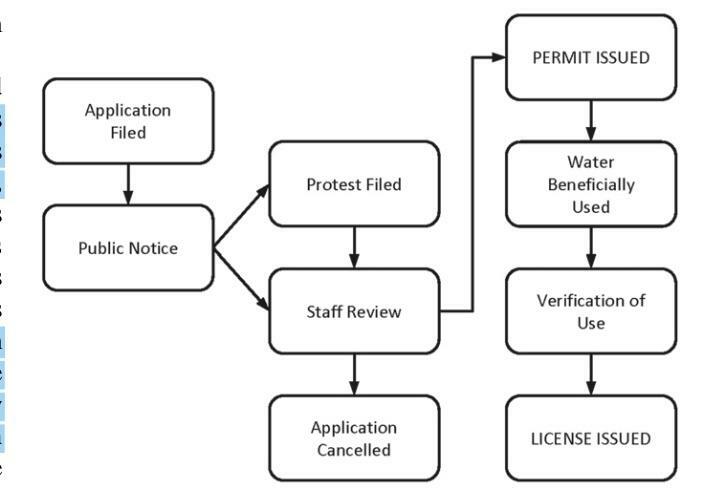 SWRCB allocates surface water rights through a permit review process followed by licensing after terms and conditions are met for at least a decade (Grantham and Viers, 2014, p. 3). Surface water rights include diversions from rivers and streams to locations separated from riparian system as well as use from lakes or reservoirs. The original approval of the permit is based on water availability, “reasonable use,” and environmental preservation. Permits are granted with terms of water use, which include: maximum seasonal/annual withdrawal, a limit on the rate and timing of diversion, where the water can be used, etc. After the monitoring period, water users are granted an appropriative licence to the water source. In order to work around over-allocation of water, the State holds the power to reallocate water rights in order “to achieve the greatest social good” (Schulz and Weber, 1987). This leaves subjective judgement to decide on the greatest social good. Although surface water rights are concurrent across the state, there is no statewide regulatory stature for use of groundwater. The SWRCB is of significant interest to the case study because “the amount of water actually used by water rights holders is poorly tracked and highly uncertain” according to Grantham (2014, p. 3). While the legislative skeleton and regulatory body (SWRCB) is clearly present, regulation has been made more difficult because water supplies are not being tracked, recorded and monitored efficiently. For the most part, land ownership grants unregulated access to the groundwater aquifer beneath the property. Groundwater resources can be regulated on a county or municipal level, allowing local authorities to prevent contamination and overuse. Riparian water rights allow property owners which border streams or rivers to use water from the riparian system. Conditions to Riparian Rights include: no storage of during the wet season and the water must be used on the riparian property (i.e. not transported for use elsewhere). Diversion structures in riparian areas must be approved by permit from the Army Corps of Engineers or a similar organization. Unfortunately, there is little to no monitoring of riparian water usage; furthermore, most estimates of total stream diversion are undervalue. In Sonoma County, the Sonoma County Water Agency (SCWA) regulates and manages riparian and groundwater resources. A board of directors, many of which overlap with the County’s board of supervisors, manages this agency. The SCWA has the authority to divert stream flows of the Russian River and Dry Creek. In order to meet minimum flow levels required by National Fisheries, water is used from Lake Sonoma Reservoir and Lake Mendocino Reservoir, two surface water sources which the SCWA have purchased for $100,000,000 and $44,000,000 respectively (Sonoma County Public Service 4.9). Recently, Sonoma County has created policies to promote water conservation and minimize resource depletion. From the Sonoma County General Plan for 2020 Policy WR-4h states, “Encourage and support conservation for agricultural activities that increase the efficiency of water use for crop irrigation, frost protection and livestock (Sonoma County, 2008). Work with RWQCB and DWR to promote stormwater impoundments for agricultural uses” (Sonoma County, 2008). In general, vineyards having been very wary of governance which would regulate their use of water. That said, in August 2015, 68 of the 130 vineyards in four of Sonoma’s watersheds volunteered to reduce water consumption by 25% of 2013 levels (Sonoma County Winegrowers 2015). Unfortunately, the reality is that this voluntary reduction represents only ~3% of total vineyard acreage throughout the county (Sonoma County Winegrowers, 2015). In order to establish confidence amongst citizens, the governance process must incorporate transparency, accountability and participation into the process. Currently, transparency is faltering amongst citizens, for they feel that many negotiations amongst industry and politicians are occurring behind closed doors. This disconnect in transparency stems from lobbyists acting within federal, state and local government entities. The three lobby groups representing the interest of winegrape growers at each level of governance respectively include: The Congressional Wine Caucus, The California Association of Winegrape Growers, and The Sonoma County Winegrowers. Included as member of the Congressional Wine Caucus are 34 of 53 congressional representatives and both of the states senators (Congressional Wine Caucus 2014). These groups have successfully established themselves into the governance framework; furthermore, taking away from the democratic process. Although citizens feel their voices are unheard, there are a number of initiatives in place to promote participation from households and industries alike. We will focus on the SCWA, which organizes a number of educational programs for both adults and children of Sonoma County. Within the SCWA, Public Affairs staff, who not only manage water education and conservation, but also governmental affairs and public outreach, are available to meet with the community to discuss Water Agency projects. Other formal opportunities have also been created for public comment. Yet, there is little guarantee that the consultation, commentary, or opinion will be “heeded” (Darby, 2010, p. 9). Accountability on the other hand, refers to the process of holding actors responsible for their actions (Darby, 2010). The SCWA has done a good job at setting expectations and criteria for behaviour. In fact, the SCWA Community and Governmental Affairs Group is responsible for conducting community outreach programming, which primarily focuses on education and awareness, but also involves the deployment of public opinion surveys to assess the performance of state SCWA services (Sonoma County Water Agency, 2015). To make up for a lack of answerability in the investigative style survey process, the SCWA has made an effort to publicly assess the success of their current initiatives and create new strategies to secure water supply. This information can be found in the Water Supply Strategies Action Plan (Sonoma County Water Agency, 2015). This initiative displays a responsibility to take action when methods are not serving the public in the way that the Agency’s mission has mandated. To complement the Sonoma County Water Summit conference initiative, which focuses on education and participation, we have also devised specific recommendations for how to improve the governance framework for managing water in Sonoma County and within the State of California. In order to secure the future of freshwater supplies for the County, we have aimed at creating recommendations that limit threats to water supply at their source, as opposed to the further implementation of costly command and control strategies (Vorosmarty et al. 2010). The following sections detail both the scope and purpose of each of the recommendations. With growing concerns over water scarcity and the ongoing drought, there is a serious need to incentivize the efficiency of water usage in California and in Sonoma County. Considering the massive economic gains that agriculture (viniculture particularly in Sonoma) and industrial activities achieve through the usage of water, it is only fair that they pay for the usage of such a precious resource. Our recommendation is a Statewide tiered water pricing system. The system would require all commercial users of surface water and groundwater to pay for their usage by volume. To further incentivize the efficient use of water resources, we recommend the pricing system be tiered, and mandated at the State level. The regulating bodies of the State would set certain quantity thresholds where the price by volume of water would increase after each cohort. In using a tiered system, commercial water users will have economically motivated goals to conserve water. The implementation of this kind of regulation system also necessitates a detailed monitoring and effective enforcement regime. The lack of monitoring and enforcement is a problem in the current framework to begin with. Grantham (2014) emphasizes the need for improved monitoring and enforcement for any new legislation to be effective. Monitoring should be done for all methods of water extraction including riparian, groundwater, and surface water. Improving these systems will be costly as they require equipment and personnel. Income generated from this pricing policy well help cover initial investments and pay for continued operation costs. Additionally, improved monitoring will be extremely effective water resources governance. With more accurate data and knowledge of water withdrawal patterns, it will be easier for the State to both evaluate and license water permits. In addition to improved water management, research and development could provide new technologies and methodologies for increasing water-use efficiency. One promising alternative for common irrigation and landscaping purposes, currently under research, is the use of treated winery wastewater (WWW). Buelow et al. 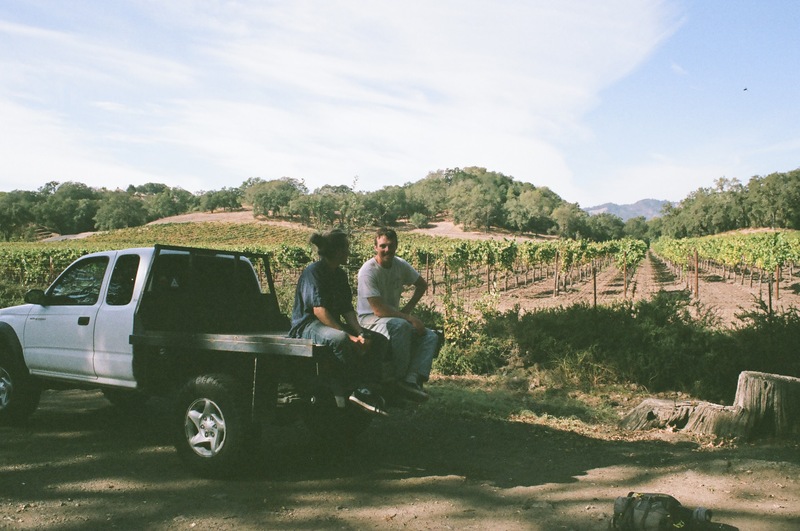 (2015) has published progressive research stating that there is potential for using WWW onsite in vineyards to reduce the burden placed on freshwater from the Russian River. The United States Department of Agriculture has stated that the study presents “the first data set of its kind to support California growers and vintners in the reuse of treated winery wastewater” (Buelow et al., 2015, p.30). Supporting research and testing such as this could lead to significant breakthroughs and provide solutions previously unknown. Here are some specific policy recommendations for the State of California. According to Grantham et al., due to “political pressures, several types of water rights including groundwater [and] riparian… appropriations were excluded from the Water Board’s authority” in 1914 (2014, p. 2). To amend this, in 2009, the Water Board began requiring reports of groundwater and riparian water usage with penalties for failing to do so. This has increased reporting, but accuracy of these reports has not been properly assessed. Firstly, we would like to recommend that riparian and groundwater appropriations be included in the permit process – these various water sources are interconnected and should managed collectively as a system. Smart metering and tiered pricing would replace the ineffective reporting system. Additionally we recommend regulations to protect riparian vegetation zones. Creating a non-development buffer zone around rivers will preserve trees and vegetation which are vital in maintaining the health of the rivers and fish as well as the integrity of its banks (as mentioned before). Permits should be required in order to develop within the buffer zone, which should only be given after thorough environmental impact assessments. Increased transparency is also a key component of a healthy and representative government. Not only does it build and promote trust amongst civic society, but it provides people with the appropriate information needed to best follow regulations and participate in decision making processes. Leveraging the accessibility of the Internet may prove the best short-term solution for increasing transparency. In our own research experience for this particular case study, we have found navigating the numerous government agency websites cumbersome and scattered. We suggest investing in a web development team to create a centralized website, which would aim to combine relevant water-use and management information from the state, regional and county-level. In addition, the website would provide access to monitoring data and reports on water usage reports, so citizens can see the progress that has been made. Schlosser, I. J. (1991). Stream fish ecology: A landscape perspective. Bioscience, 41(10), 704-712. Vorosmarty, C. J., McIntyre, P.B., Gessner, M.O., Dudgeon, D., Prusevich, A., Green, P., Glidden, S., Bunn, S.E., Sullivan, C.A., Liermann, C.R. and Davies, P.M. (2010). Global threats to human water security and river biodiversity. Nature 467: 555-561. Little Hoover Commission. (2010). Managing for Change: Modernizing California’s Water governance. Accessed 25 October 2015. Littleworth, A., & Garner, E. (2007). California water II. Point Arena, Calif.: Solano Press. Sonomawinegrape.org,. ‘Regulatory Update And El Nino Preparations For Growers | Sonoma County Winegrowers’. N.p., 2015. Web. 1 Nov. 2015.